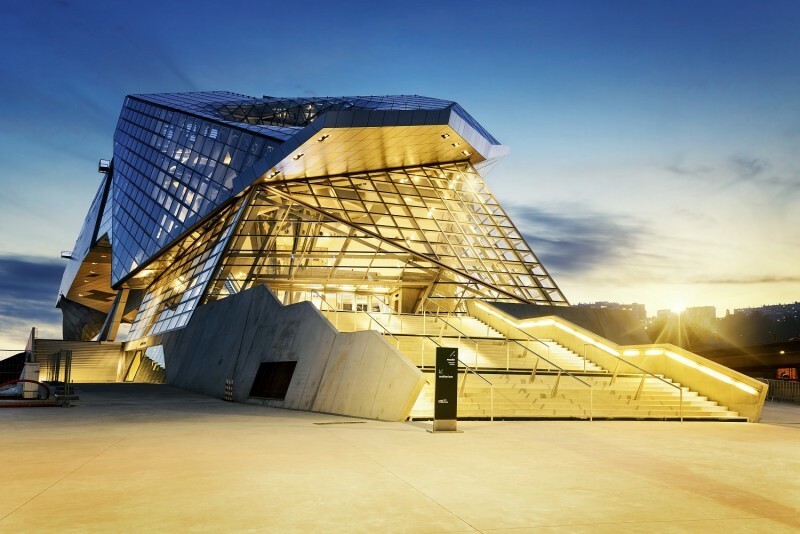 The Musée des Confluences is an exceptional new museum (even for France), and a welcome new symbol for France’s second largest city, Lyon.Boasting audacious architecture and a breathtaking view, the Musée hosts a number of enticing exhibits and temporary exhibitions. Located at the gateway to the city — where Lyon’s two rivers, the Rhone and the Saone meet — the Musée des Confluences has rapidly become the newest symbol of the urban area known worldwide as the culinary capital of France. Through its boldness and scope, it embodies the renewal of Lyon, and more specifically of the Lyon-Confluence district where it is located. This area is undergoing a total transformation, fast becoming a showcase for the city of the future.Designed by the famous Austrian architectural firm Coop Himmelb(l)au — known for its works typical of Deconstructivism, such as the BMW Arena in Munich or the headquarters of the European Central Bank — the Musée des Confluences evokes a meeting between a crystal and a cloud, materialized within the building’s 22,000 square meters. Less than one year old, this monument hosts a vast permanent collection which interconnects different disciplines to tell the story of mankind. The collections were mainly compiled in the 17th century by Emile Guimet. Four exhibitions entrusted to separate exhibition designers offer visitors an experience that explores the origins and destiny of humanity: Origins — The Narratives of the World; Societies — The Theatre of Mankind; Species — The Tapestry of Life; and Eternity — Visions from Beyond. The Musée des Confluences stimulates curiosity, emotions, and amazement, by simultaneously drawing from various scientific disciplines (paleontology, mineralogy, entomology, science and techniques, etc.) and mythological references. In addition to the permanent exhibitions, the Musée des Confluences will also feature intense temporary shows over the next three years. Musée des Confluences is also a prominent public place to spend an evening in Lyon. People can visit the Crystal, walk across the base and enjoy the confluence of the Rhone and Saone from the garden. This exceptional setting outside the confines of the protected city center has been recognized by UNESCO.The museum’s restaurants are tempting destinations of their own. Run by two Lyon-based chefs — Guy Lassausaie, a two star Michelin chef, and Jean-Paul Pignol – they serve light fare at the Comptoir Gourmand on the museum’s roof, while the Brasserie des Confluences, surrounded by shallow pools of water, provides a true gastronomical dining experience. To expand your itinerary for this interesting and delicious city, visit the Only Lyon tourism website at http://www.en.lyon-france.com/.